Yes, faithful reader, it’s another SASB day. But, unlike the eclectic content of most of our recent pastiches operating under that appellation, today we present a common theme: alternative energy, or POWER! 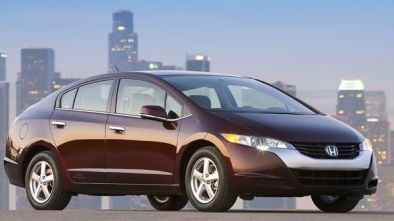 First up, a driver’s review of a new Honda, the FCX Clarity (FCX = Fuel Cell eXperimental? ), powered by a hydrogen fuel cell, soon to be released in tiny test quantities in — where else? — California early in 2008. OFTEN, it is the smallest of gestures that deliver the most powerful messages. I was reminded of this last month when I settled into the driver’s seat of the FCX Clarity, a sedan powered by fuel cells that Honda will begin leasing to a handful of private customers next summer. Fresh from a briefing that detailed the car’s NASA-grade complexity, I wondered what procedures might be required to start the reaction of hydrogen and oxygen and bring the power supply to life. MUDGE has been intrigued by the possibilities of fuel cell powered vehicles (and fuel cells for other applications, see below) for some years. and, always the crucial unasked question — what’s the energy cost to bottle hydrogen, anyway, and is the total life cycle cost truly significantly lower than petroleum-based fuel? Indeed, how much petroleum based fuel is used to create the hydrogen in the first place? But, hydrogen fuel cells are so seductive: hydrogen is abundant (and not just in politically dicey parts of the world), and the output of hydrogen fuel cell power generation is water. What’s not to love? Until now, writing about fuel cells has been a no-risk proposition, with no reality check looming, no looking back when the cars arrived in showrooms to see whether one had been embarrassingly optimistic. Way back in the 1990s, a physicist assured me that fuel-cell cars were 20 years away — and always would be. So Honda has surprised the automotive world by producing a vehicle far closer to practical manufacture than anyone else in the industry, and the lucky guy from NYTimes got a chance to drive it. Those Honda engineers — remarkable achievement! Now, when will there be even one hydrogen pump on even one corner in even one town? Each day consumers snap up 10 million Bic razors and 5 million of the colorful plastic lighters made famous by the ad campaign “Flick My Bic.” Those volumes pale in comparison to Bic’s ubiquitous pens: The French company sold its 100 billionth in 2005. Bic, which had sales of about $2 billion in 2006, has spent 30 years honing the art of making disposable consumer goods. Now, Bic wants to use that expertise for something far more challenging than pens or lighters. It’s designing disposable cartridges for fuel cells, a kind of power supply that could someday eliminate the need to constantly recharge mobile phones or laptop computers. Electronics makers are drawn to fuel cells because today’s rechargeable batteries can’t keep up with the demands users place on portable gadgets. If you spend any time surfing the Web from your phone and e-mailing your friends, as well as making calls, you probably have to recharge at least once a day. With a fuel cell, you’d never have to look for an outlet; You’d just pop out a spent fuel cartridge and insert a new one. See, a fuel cell is a generic term, for any container capable of producing electricity from a chemical reaction, as opposed to batteries, as found everywhere, including in those Prius hybrids so popular (and so uneconomic in true terms! ), which store electricity. So, rather than automotive, Bic’s fuel cells are pen cartridge sized, appropriate for those mobile electronic gadgets that are more and more vital to our daily existence. Bic has no desire to manufacture the fuel cells themselves. These devices were first commercialized more than 50 years ago and are used in various industrial settings. Bic will leave that part of the business to companies such as Samsung and LG, which are eager to sell mini fuel cells—assuming they can bring down the price and the size enough for them to fit in a handset. If the electronics makers succeed in their mission, Bic sees a big opportunity in the replaceable cartridges, which might actually resemble the ink containers in its pens. Each one would cost just a couple of dollars, and could conceivably keep a mobile phone running for weeks at a stretch. If Bic and the fuel-cell makers can get the engineering right, “they could significantly extend the run time of portable devices,” says Heather Daniell, a technology analyst at New Energy Finance, a London market research firm. Imagine, weeks of cell phone use, then when the charge gets low, just pop in a new $2 battery. And, read to the end of the BW story, and see a teaser about how fuel cells might provide cheap power for our troops in the field, for all of the mobile devices that are so critical to the conduct of modern warfare. So, we move from fuel cells to wind generation, a recent topic in this space. here for example. No question that interest in alternative forms of energy generation is growing. Once again, NYTimes has a tale of kite-like objects that might one day provide inexpensive power from a thousand feet above. 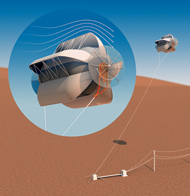 The helium-filled Magenn Air Rotor System contains a turbine that spins around a horizontal axis and can produce 10 kilowatts of energy as it floats 1,000 feet above the earth while attached to a copper tether. Can’t help but be intrigued, but also to wonder about the underlying assumption — is it really constantly windy at 1,000-feet up? But, a patent has been issued, and investors have been found, so someone has been telling some excellent stories. So, that’s our alternative energy SASB. Have to admire the inventiveness of the globe’s researchers, engineers, and software wizards, and admire the gutsy investors and entrepreneurs who appreciate those good stories, and put their money where geeky mouths are. This entry was posted on Wednesday, December 12th, 2007 at 8:23 pm and is filed under Business, Environment, musings, Science, Technology. You can follow any responses to this entry through the RSS 2.0 feed. You can leave a response, or trackback from your own site.